In this article, group exercise instructor and fitness expert Jim Scott Polsinelli interviews Hugo Rivera on several topics related to fat loss and achieving your fitness goals in the New Year. [HR] No, not at all. Thank you so much for the kind words! The honor of being interviewed is all mine, so thank you. [JP] As you know, the New Year is here and people are beginning to take care of their resolutions. What are the smartest things people can do to stay true to their New Year’s resolution of dieting? 1) Create a limited timeline by which to achieve your goals. This increases your chances of achieving them since, provided that you wholeheartedly commit yourself to the set date, then every workout and every day that you stick to your diet counts; you can no longer procrastinate. • I will eat 5-6 balanced meals a day (1 every two to three hours). • I will exercise with weights and do cardio three to six times a week. • I will get 8 hours of sleep (7 minimum) every day. • I will drink ½ – 1 gallon of water a day. 4) Take bi-weekly pictures to track progress: It helps tremendously to take pictures of how you currently look (be sure to also document, current measurements, bodyweight, body fat, etc…). This is a great way to stay motivated as when you look at your pictures from now, and then you look at pictures of yourself every couple of weeks, you will see a difference and get more motivated to keep training harder and also stay with the program when temptations to cheat on the diet or skip a workout come to your mind. 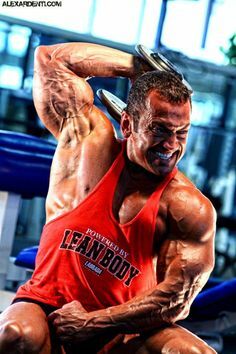 5) Having the ‘Mindset of a Successful Bodybuilder’: For any challenge that the successful bodybuilder faces, a solution is researched and executed in order to continue with the bodybuilding lifestyle. There is no room for frustration or thoughts of dropping the bodybuilding plan in the mindset of a successful bodybuilder. They always think damage control, never “falling off the wagon”, so to speak, as once off, you run the risk of never getting back on. 6) Be Prepared: Remember to prepare all your meals the day before, so that when you are at work, you already have all of the food that you will need for the day with you. That way you limit the amount of times you’ll be tempted. 7) You Control The Helm! : Remember that only you control what goes in your mouth. Food does not control you! 8) Believe in Yourself: As funny as it sounds, there must be no doubt in your mind that you can make this transformation a reality. If not, you won’t be able to achieve your desired results. Believing in yourself is really the first step. If you don’t believe in yourself, who will? [JP] Nutrition-wise, what should people be eating before they have an intense cardio workout? How about post workout? [HR] It depends on what the person is looking to accomplish. If fat burning is the main goal, then cardiovascular exercise is best performed first thing in the morning on an empty stomach with perhaps just a strong cup of black coffee (with around 200 mg of caffeine) prior to the workout. Of course being well hydrated with Spring water prior to and during the workout is advisable as well. 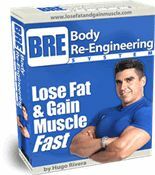 While there is now conflicting research indicating that cardio should not be performed on an empty stomach due to risk of muscle loss, I have seen that taking 5-10 grams of BCAAs plus 5 grams of glutamine prior to the cardio will do an excellent job at keeping the muscle right where it should be. I also like to consume 3 capsules of EFA’s prior to the cardiovascular activity as well due to its anti-inflammatory and fat burning properties. [JP] What are the biggest mistakes gym-goers make when it comes to dieting? [HR] Some approach dieting with the less is better approach so they cripple their metabolisms by eating once or twice a day. Others think that by going to the gym they can do whatever they want in terms of dieting and that is not the case at all. You’d think that with all the muscle I carry I could eat whatever I want but if I did, I would just get fat like anyone else would. [JP] Is it possible for regular people (like me) to get a six-pack? How so? [HR] Oh, so are you saying I am not regular? Perhaps abnormal….haha. Just kidding. In answer to your question, I am as regular as you are. Back in my pre-teens I was overweight as a matter of fact. So if a former obese kid like myself can get in the sort of shape that can get you to be a top national bodybuilding competitor I would assume that so can anyone else. What enabled me to achieve my fitness goals is what I referred to earlier as the ‘Mindset of a Successful Bodybuilder’ coupled with an unwavering determination to do what needed to be done diet-wise and training-wise in order to get my abs. 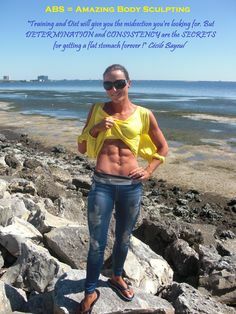 Abs are the sort of muscles that all of us have actually but in order for the most of us (with average genetics; and that includes me), until the diet becomes one that is practically perfect you will not be able to drop enough body fat to see them. By a perfect diet I mean to say a diet with meals that are consumed once every 2-3 hours, that have a serving of complex carbs, a serving of lean proteins and some good fats. Keep in mind that though it sounds hard to get all of these meals in, they do not necessarily need to be real meals. A diet that consists of a breakfast, a lunch and a dinner with meal replacement powders in between will do the trick. (Please see the attached sample diets below). [JP] What are your favorite super foods? * Starchy: Oatmeal (truly a super food as it has fiber and good fats as well), Brown or white rice, baked potatoes, sweet potatoes. Chicken (tons of it), Egg Whites, Tilapia, Salmon (which is a great source of EFAs…I consume it twice a week), and top sirloin steak (I consume it once a week). Fish Oils, Flaxseed Oil, EFA capsules which are super convenient and offer a nice blend of all the oils. [JP] What are the absolute worst foods to eat? [HR] By far pizza is the absolute worst one. I’ve seen great physiques ruined in a few days of overindulging in this food. Also, anything loaded with trans-fats so please check the label and if in the ingredients list you read something that says ‘partially hydrogenated oil’ then kindly leave the food item on the shelf. 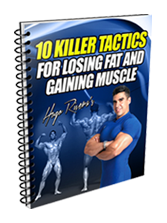 These fats cannot really be utilized properly by the body because they are man-made. In a nutshell, a trans-fat is a fat with additional hydrogen atoms that have been added artificially in order to give the fat a higher melting temperature. It is great for preserving food longer and improving the consistency of baked goods but the problem is that the high melting temperature makes it easy for it to get stored in our arteries. Why? Because our bodies on the average run at 98.8-degrees Farenheit. These fats need over 100-degrees to melt them. It is my personal opinion that these fats have played an integral role at increasing obesity, heart disease and diabetes, amongst other health maladies. [JP] What are simple tips to consider when dining out to eat healthy? a) There is nothing better than being in shape. b) You control everything that goes into your mouth. c) Food does not control you. 2) Always combine a serving of low fat protein (in the case of fast food restaurants, this is either skinless chicken, turkey, salmon, or top sirloin which I only advise be done once a week) with a small serving of carbs like a plain baked potato or steamed rice. Remember that if you are eating a chicken or turkey sandwich the bread will count as the carbs. 3) Salads in addition to a serving of protein and a serving of starchy carbs are always good since they provide fiber and they fill you up. However, avoid using high fat/high sugar dressings. 4) Refrain from using high carbohydrate high fructose corn syrup sauces or mayo. [JP] It’s easy to get frustrated about your body when you want to change it but you see the same cycle continually repeating itself. Any words of motivation? [HR] If you are not making progress you need to sit down and see what is it that you are doing that is preventing you from making it. Once you determine what the problem is, fix it! Don’t expect changes if you keep doing the same thing. Nine times out of ten the problem can be found in the diet. Other times, some people simply train too much. For the most part, training more than 6 days a week for 45-60 minutes with weights and doing more than 45 minutes of cardio a day becomes absolutely counter productive. Training more than this sends the body into a state of overtraining which causes it to lose muscle and thus cripples its metabolism. [JP] What’s your diet like? I know you’re a competitive bodybuilder, so the off-season and on-season are two completely different animals. How many calories do you shoot for a day? And how many times a day do you eat? [HR] My diet is extremely similar to what I attached at the end of this article (around 2500-2700 calories). The only difference is that I typically just do one shake and the rest are real meals. I also may add a seventh meal on my leg days to help with recuperation. Since you have experienced what one of my leg days look like, you can appreciate the value of a seventh meal (LOL). In addition, on Saturday or Sunday I may go to a Steakhouse and have me a 12 oz top Sirloin Steak with a couple of plain baked potatoes and some diet soda. That’s my ‘cheat meal’ so to speak. The biggest difference for me off season versus competition training is the fact that I do more cardio when getting ready for a competition and drop my carbs a bit from what you see in the attached diet. Nothing major though since I am always eating healthy. [JP] How do you stay so disciplined? [HR] Well, to be honest with you, it has taken me years to build my physique to this level so I don’t want to ruin it. In addition, since I am a role model to many and I am constantly offering advice on what needs to be done in order to get in shape, I’d feel very hypocritical if I am prescribing something that I do not even follow myself. Also, I simply like feeling great all the time by having the right diet and training program. For me, bodybuilding is a healthy lifestyle that can (and should be) followed by anyone. 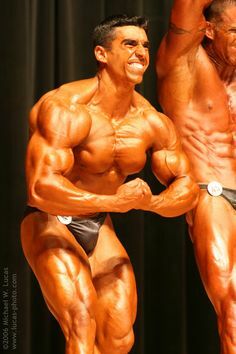 When I talk about bodybuilding, I’m not referring to competition nor looking like you could compete. To me, a bodybuilder is anyone that uses weight training, cardiovascular exercise and nutrition to accomplish specific fitness goals. So instead of focusing on having to diet and exercise to get slim for a wedding (or just for the beach) and then back to the same old eating habits focus on following a healthy bodybuilding lifestyle instead. Only this will guarantee permanent results. [JP] What’s your favorite guilt-free food to eat? [HR] Oatmeal mixed with chocolate protein powder. It’s to die for (at least for me anyways..LOL)! [JP] When it comes to dieting, what’s been the most helpful piece of advice you were ever given? 1) Food will not make you fat; only the abuse of the wrong sorts of foods will: This statement saved me from the anorexia I suffered back when I was 12 years old. 2) The less you eat the more your metabolic rate slows down: Therefore, in order to burn fat permanently, one needs to keep the metabolism up by having several feedings throughout the day composed of a small portion of protein, an equal portion of complex carbs, some vegetables and good Essential Fatty Acids. 3) Only the correct diet along with weight training and aerobic exercise will give you the body you are looking for: Dieting alone at the end of the day cannot build muscle which is essential for not only keeping the metabolism up but also for shaping your body. [JP] This is all awesome information Hugo; thanks for all the detail. So in a nutshell, what is your philosophy on fat loss nutrition and could you provide us with a sample diet and supplements program? [HR} Losing fat is a matter of creating a slight (notice the word slight) caloric deficit in order to start losing weight in the form of fat. This caloric deficit can be created through an increase in activity, a decrease in caloric intake or both. My strategy to save muscle as I go down in body fat is to do the minimum amount of cardiovascular activity that I can get away with at the time while keeping the calories as high as possible. Every so often, then I either reduce calories slightly again or increase the Cardio a bit in order to keep results coming. Keep in mind that I do not know exactly what your schedule looks like so please feel free to adjust the times to match your schedule. As long as there are at least 2 but no more than 3 hours in between meals, you can move the times accordingly. Also, I assumed that training will happen at 6pm so if you train at any other time, simply move the pre-workout supplements and post workout meals accordingly. Meal replacement packet mixed with 20 grams of carbs from cream of rice, grits, or oatmeal or 40 grams of protein powder mixed with 50 grams of carbs from cream of rice, grits, or oatmeal. High Calorie Days: Choose two days of the week, preferably leg days, to slightly increase your calories in order to prevent the body from adapting to the diet. Do this by slightly increasing your carbohydrates by adding a half a cup of oatmeal in the morning, and half a cup of rice to meals 3 and 5. Also, do 1/3 cup of cream of rice after the workout. On non-workout days, trade the post workout meal for a solid meal consisting of salmon and green beans or any other green vegetable. ½ Meal replacement packet mixed with 20 grams of carbs from cream of rice, grits, or oatmeal or 20 grams of protein powder mixed with 25 grams of carbs from cream of rice, grits, or oatmeal. NOTE: Choose two days of the week, preferably leg days, to slightly increase your calories in order to prevent the body from adapting to the diet. Do this by slightly increasing your carbohydrates by adding 1/4 cup of oatmeal in the morning, and 1/4 a cup of rice to meals 3 and 5. Also, do 1/4 cup of cream of rice after the workout. On non-workout days, trade the post workout meal for a solid meal consisting of wild Atlantic salmon and green beans or any other green vegetable. Definitely make sure that you cover at least the basics of supplementation which are a Multiple Vitamin and Mineral formula, 3 grams of Vitamin C split in 3 equal servings throughout the day, 200mcg of Chromium Picolinate, and essential fatty acids coming from either fish oils, flaxseed oil or EFA capsules which have several good fats that have been proven to enhance health and performance. Also, for convenience purposes a good meal replacement or protein powder is a great way to add valuable calories and nutrients to your diet. For protein I have been using the Pro V60 protein powder as it is a nice blend of 5 different proteins (fast and slow released) that easily mixes with any cereal I want to add it to. For Meal Replacements I love the new Lean Body Meal Replacement Powders. [JP] Hugo, thank you so much for such a great interview. I wish you tons of continued success and thanks again for all the inspiration. [HR] Jim, thank you for the opportunity. Keep up the great work as well inspiring people and helping them get in shape up there in Virginia. I’m sure that all your students appreciate very much the help and motivation you provide them with! Sinfully Healthy Food – The Secret Behind This 48 Year Old Fitness Model’s AMAZING Body!